School of Fish: A great turn out! On Thursday night, our village church hosted a viewing of a film about Jesus which was in Luganda, the local language. There is a Jaja (a grandmother) who we drive to church because she cannot walk well. She also wanted to come to see the movie, so we went to pick her up. When I stopped our van at her house, others asked if they could come and ride in our van. I thought that it would be great for more people to hear the gospel, so I said yes. 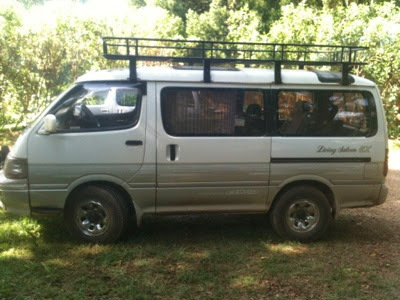 Our van has 8 legitimate seats, although we often find ways to transport 10-12 people since kids usually sit on laps here. But on Thursday night, 25 people climbed into the back of our van! I was driving and Elijah was in the front passenger seat, for a grand total of 27! (The movie was scheduled to begin at 8pm, so David stayed home with our other three kids.) here is a picture of our van so that you can imagine it. I tried to take a photo that night, but it was too dark. Twenty-seven people is even more than they usually cram into the vans that are used as taxis around here. In the village, the dirt roads are not very level, and since it is the rainy season the roads are muddy and slippery. While I was driving, I was also praying that God would get us all safely there! We arrived, but since many in the village do not have flashlights (called torches here) and our church does not have electricity, we were all just sitting in the dark waiting for the generator and projector to arrive. Jonathan, our pastor and friend, suggested that maybe I move the van so that the headlights could shine in through the doorway to provide a bit of light. While we waited for the movie, I talked with a few of the teenagers from the village about singing some songs. We took turns teaching one another songs in Luganda and English. It was a nice time. The delay for the movie was related to incompatible technology, so Mark Gwartney, our team leader, ended up bringing a TV and DVD player from his house. It worked out well to start later because many people came on "African time." The church was so full there was not a place to sit. Many people stood at the doorway or in the back for the whole movie. I stood outside enjoying the beautiful stars and praying for those who were hearing the good news. At the end, Jonathan was able to stand up and share the gospel with probably 200 people. On a given Sunday, our church can have up to 100 people in attendance, but over half of those are from GSF. Some of the older GSF kids came to the movie, but the room was mostly filled with people from the village. Please pray with me that many will come back to worship at Light of the World church on Sunday. While many Ugandans have heard the gospel, there is very little discipleship. One evening at our home, Jonathan shared his concern that the Ugandan church as a whole does not have much depth in their faith. They have only received milk, and he wants to see Ugandans feeding on the solid food of God's Word. It is our prayer that this outreach will be the beginning of that process of discipleship for many in Buundo village.